Can SGLT2 Inhibitors Halt "Glycemic Roller Coaster" in Type 1 Diabetes? Reseachers are studying whether drugs that have been approved for treating type 2 diabetes can be used in combination with insulin to avoid both variablity in blood glucose and weight gain. In recent years, a host of new medications across multiple classes have been approved to treat type 2 diabetes (T2D), and some even help patients lose weight. Next comes the question: can any of these therapies work alongside insulin for patients with type 1 diabetes (T1D)? “There is a huge medical need in this patient population to find different medical treatments to avoid these highs and lows,” she said. Alba presented results from the largest study of an SGLT2 inhibitor in T1D to date, canagliflozin (Invokana). The mechanism of action in this class has long interested researchers because it works independently of insulin and expels excess glucose through the urinary tract. However, there have been increased concerns about urinary tract infections, a known possible side effect in the T2D population, as well as the potential for diabetic ketoacidosis (DKA). Researchers who presented an earlier set of results said that those who experienced serious DKA had precipitating factors, such as insulin pump failure. As Alba discussed Monday, DKA events have been dose dependent, with more occurring among patients taking the 300 mg dose of canagliflozin. Findings reported at this year’s ADA session examined how well canagliflozin helped T1D patients stay within a target blood glucose range of >70 to ≤180 mg/dL). Patients were randomized to take either the 100 mg dose of canagliflozin (81 patients), the 300 mg dose (78 patients), or placebo (77 patients). The study then measured how often patients taking canagliflozin were above target or below target relative to placebo. compared with placebo. (see Table). Crossover Study of Liraglutide in Type 1. The GLP-1 receptor agonist liraglutide (Victoza) has is approved in 1.2 mg and 1.8 mg formulations to treat T2D and in a 3 mg formulation to treat obesity, and Novo Nordisk has application pending for a combination therapy of its Tresiba insulin and liraglutide pending at FDA to treat T2D. So, the investigation of liraglutide in combination with insulin for those with T1D who are overweight or obese. Investigators designed a 52-week, double-blind crossover study in which in which groups took either insulin and placebo or insulin and liraglutide for 24 weeks (with the study drug titrated from 0.6 mg to 1.2 mg to 1.8 mg over 1 month). Following a 4-week washout period, the groups switched treatments for another 24 weeks. While taking liraglutide, patients saw A1C fall from 7.4% to 7.1%, daily total and bolus doses of insulin fell from 70.9 to 66.7 units and from 39.3 to 34.6 units. Systolic BP fell from 126.5 to 116.3 mmHg; diastolic did not significantly change. Body mass index fell from 30.5 to 28.5 kg/m2 and lipid parameters did not change except for tendency of increased high-density lipoprotein cholesterol on liraglutide. Researchers concluded that adding liraglutide improved the metabolic profile of obese T1D patients and reduced insulin needs. 1. 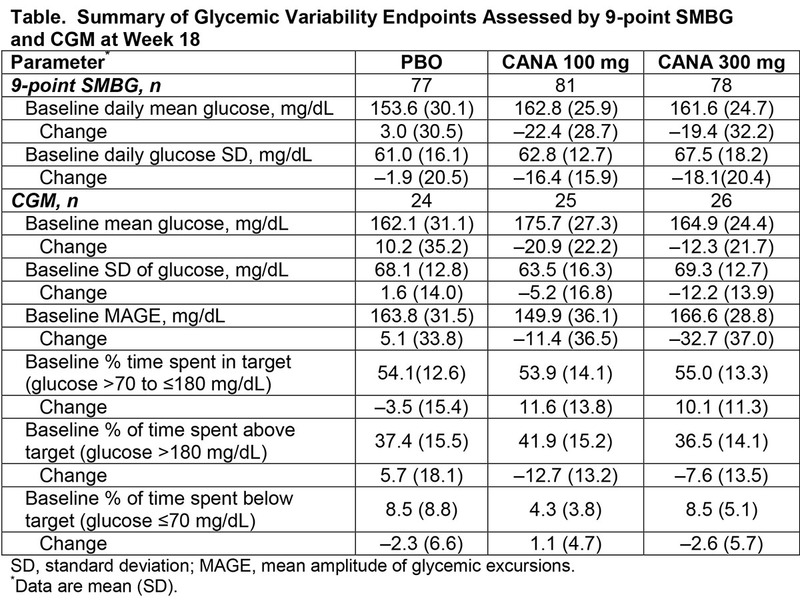 Rodbard HW, Peters AL, Cao A, Alba M. Canagliflozin (CANA) improves glycemic control and reduces glycemic variability in patients with type 1 diabetes mellitus (T1DM) inadequately controlled with insulin. Diabetes. 2016; 65(suppl1) 291-OR. 2. Dube MC, D’Amours M, Weisnagel J. Crossover, double-blind, unicentric 52-week trial of liraglutide in type 1 diabetes. Diabetes. 2016; 65(suppl1) 292-OR.